School’s (almost) out for summer—which means it’s time to start planning a getaway. If Europe is on your agenda, Travel + Leisure has you covered with lots of ways to save money as you plan. But the very first step is knowing how to be in the right place at the right time. For that, we’ve rounded up data-driven suggestions from Booking.com. According to their insights, Americans are most likely to head to the continent’s capitals: London, Paris, and Rome. There are more cost-effective destinations—and we’ll get to that in a second—but if you’re also keen to visit one of the Big Three, then you ought to plan on visiting in August for the best prices across the board. Doing so will save you 24 percent off compared to a June or July trip, but be prepared for lots of stores to be closed—much of Europe is also on vacation that month. Hitting alternative destinations is a smarter way to save. That’s why we’ve partnered with Booking.com to select European cities that might not be on the list of America’s most popular summer getaways, but should be. We’ve also figured out the cheapest month to visit and ideal traveler profile (groups, couples, families, or solo). But don’t forget about saving on flights, too. To do that, book your tickets eight to ten weeks out from your trip—that’s when historic data from Kayak shows you’ll get the best deal. Consider extra charges from budget airlines (which could cover anything and everything, down to choosing a basic seat), baggage weight restrictions (in case you’re planning to bring home a haul), and transit costs if you’re flying to a secondary airport. And don’t overlook airline-specific, obscure fees, like forgetting your printed RyanAir boarding pass at home (it can cost you $30 to have it reprinted at the airport). More of these tips can be found right here. 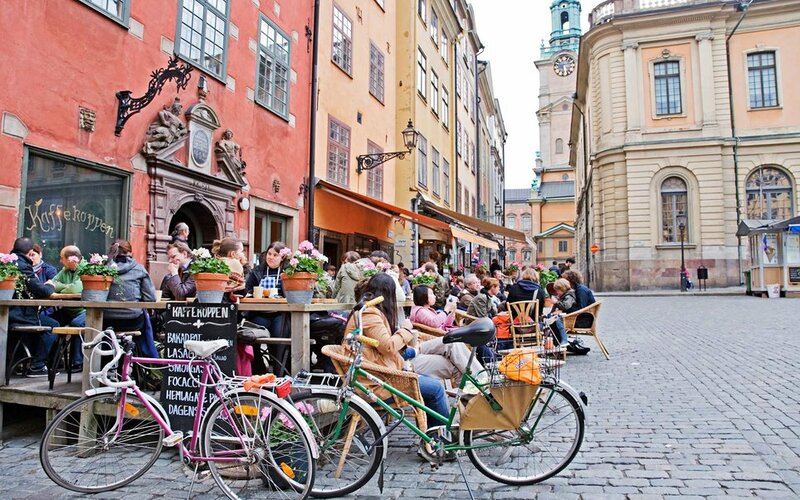 Why book it: This city has such a vibrant café culture, you’ll feel like a local just by settling in with a journal, coffee, and a kardemmumabuller (translation: a supremely delicious, only-in-Sweden variety of the cinnamon bun made with plenty of cardamom instead.) Going in July means a 16 percent saving over trips in June, when summer prices are at their peak—and it also means long days of Scandinavian sun. While you’re there, be sure to hit the coast for fresh-from-the-fishermen shellfish, usually piled high on rye toast. Why book it: You can break the bank staying at a hotel like Le Sirenuse—a global standard setter for service and style. But you can make up some of the difference by traveling in June rather than July, when prices max out in this seaside stunner of a destination. Why book it: July brings tons of cultural events to Prague—everything from the supersized Bohemia Jazz Fest to a staging of Mozart’s Don Giovanni in the same theater where it first premiered in 1787. Stay in the beautiful new Boho Hotel, which just opened in December with minimalist, grey-on-white interiors in the historic city center. Why book it: Going in August means you’ll encounter pretty hot temperatures and some store closures in Madrid—but you’ll also save 21 percent over a trip in June. The good news is that if you’re smart about planning, neither of those two caveats will get in your way. For one thing, museums like the Prado are still open—and have far fewer crowds (along with plenty of air conditioning). And there’s always plenty of gazpacho and sangria to keep you cool, nearly anywhere you look.